Himself just brought the tree home from our storage - guess it's time to decorate for Christmas. Not quite yet, though. I need to finish my Christmas cards first. This was such a fun technique!! I love the effect that comes from stamping on kraft with white first, and then stamping with the color. I also did some white spatters and I think they really stand out on the kraft color. The PTI Rosie Posie stamp set lends itself so well to this. So that's it for me right now. I adore your comments, thanks for stopping by!!! This week I am the host over at the Mod Squad Challenge. Our sponsor is the wonderful stamp company Kitchen Sink Stamps. Kitchen Sink Stamps offers us a discount. CODE: ModSquad. You can pick your own goodies and there are a lot of choices! I stamped the shooting stars and firework sprays all over the card, heat embossed it with white embossing powder from GKD, then sponged with Dusty Concord and Faded Jeans Distress Ink. The card stock is GKD White and Navy, and Stampin' Up Rich Razzleberry. Greeting is from the GKD Mountain Wilderness stamp set. I die cut the star from glitter paper and attached the silver thread to it. I stamped the image on GKD Wild Wisteria Card Stock with GKD Wild Wisteria Ink for a tone on tone look, using 2 of the 3 stamps. Then I splattered with gold paint and used my white gel pen to add dots of white. The greeting is from a Mama Elephant stamp set Sunday Sentiments, and it was embossed with GKD Gold Embossing Powder on vellum. Thanks for stopping by, I adore your comments. You still have until noon on Tuesday, November 24th to join in, so run right over there and be a part!! It's raining again here, and our grass is still green. What's up with that????? Thanksgiving is only a week away!!!! I made this card today for the StampTV challenge. One of my dear online BFFs is hosting this week. Barb Campbell is so talented, she always inspires me. Check out her blog HERE. She asks us to use a snowman on our card. I just love this particular snowman image from Gina K Designs. It's so conducive to paper piecing, which is what I did here. The patterned paper pack is one I just purchased recently. Very Christmas-y, but all purples and blues. I love it. I got out my white gel pen and gave his scarf some texture. We are heading to Traverse City in a little while to have our anniversary dinner. Our anniversary is on Thanksgiving this year, so we thought we would celebrate early. 49 years!! I was 9 when we got married....haha. Thanks for stopping by, I adore your comments. Stay warm, my friends. I had such a good time making this card. Taking a bunch of little stamps and making a motif is super fun, and I love the results. Betsy Veldman over at Papertrey Ink has a wonderful video showing how to do this. Check it out HERE. I used several stamp sets for this card (see below), and the inks I used are all Distress Inks: Fossilized Amber, Cracked Pistachio, Mermaid Lagoon and Abandoned Coral. This was stamped on GKD White Card Stock and mounted on a GKD Blue Raspberry card base. I was amazed how well the Mermaid Lagoon ink matched that blue paper. I will definitely be doing more of these - they are really so much fun. Thanks for stopping by, I adore your comments!! What a beautiful day here in Northern Michigan. Why am I not out enjoying the sunshine and 60 degree weather? I'm playing in my craft room of course. Mod Squad Challenge - silver or pearl in recogniton of lung cancer awareness. Power Poppy - embellish this. This was a pretty simple card to make. 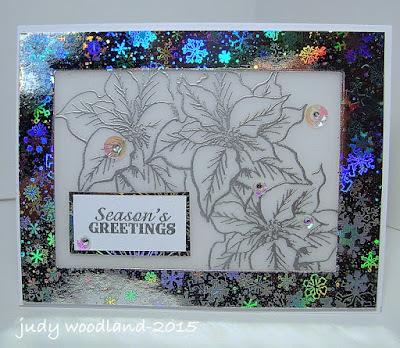 I heat embossed those poinsettias from Melanie Muenchinger's A Year of Flowers stamp set using GKD silver embossing power. They are embossed on vellum, then placed behind the "frame" of holographic snowflake paper and popped up using foam tape. Then I embellished with sequins and gems. This card is so sparkly - the photo, of course, doesn't do it justice. You just can't photograph sparkle. Thanks for stopping by, I adore your comments. Hope you have had a wonderful weekend!! 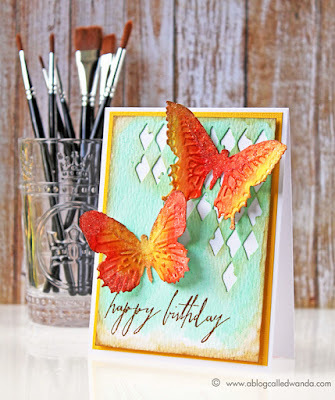 The card I have for you today was made for the Challenge over at Kelly Latevola's Blog. Her Challenge celebrates the One Year Anniversary for this series, CASEing Genius Challenge. Check out the blog to see all the details. I decided to CASE (Copy And Share Everything) a card by Wanda Guess. She has such great style, and I loved this card in particular. Isn't it gorgeous? I decided to switch it up a bit and use this beautiful butterfly die from Stampin' Up. I also chose to use bright colors for the background, which was done with the watercolor smooshing technique. The last part of the challenge asks us to nominate another talented artist to be a future genius. I have so many creative wonderful friends, it was hard to chose just one. I finally settled on Cindy Horvath. I really love her style, she has such an eye for color and design. I encourage everyone to check out her wonderful work. Thanks for stopping by, I adore your comments. We are looking forward to a little snow at the end of the week. I can't think about that right now....haha. I have recently gotten a new color from Stampin' Up called Tip Top Taupe, and for some reason I just LOVE it. Got the card stock and the ink. I popped up the two panels on fun foam, so this card has some dimension. Used the stamping off technique for the soft background and then did the focal images with full strength ink. So that's it for me tonight. Hope everyone has an awesome week. Thanks for stopping by, I adore your comments. the Wild Thangs have gone and it's quiet around here now. I finally have a chance to do a couple of posts. This was a fun card to make because it really went fast. The focal is the greeting, I kinda like making these kinds of cards. I love the papers here, I think they make the card. I have another card to show you today too, so stay tuned. Thanks for stopping by, I adore your comments. One more card done with just stamping. I'm lovin' this - so refreshing. I used the Flower Favorites stamp set by Papertrey Ink. It uses multiple stamps to create a dimensional look. Love using different colors of ink to make the image pop. And don't you adore that cute little bee? I'm so partial to those buzzy little things! Simon Says Monday, Throwback, July 13, 2015 Anything Goes! Whew, that's it for me. This is my third blog post today. Guess I'll go find a cup of coffee. Thanks for stopping by, I adore your comments!! I had forgotten how much I love stamping. I think I have become so ensconced in using dies and trying new techniques that I didn't stamp for stamping's sake any more. The Just Us Girls Challenge is hosted this week by my dear friend, Sharyn Polesel. She is uber talented. Visit her BLOG and check out her work. Her challenge is to do a one layer card EEK - what???? No layers? C'mon!!!! But I found out that just stamping on a card front is very fun. I used a stamp set by Papertrey Ink called Flower Favorites. This is a multiple stamp set, so you get some real dimension by using several colors. Hope you are having a lovely weekend. Thanks for stopping by, I adore your comments! I recently watched this VIDEO by Kelly Latvola. It looked intriguing, and I had to try it. I really had fun with this one. I used a stamp set from Papertrey Ink called Day Dreamer, and several different Distress Markers to color on the stamps. Then I broke out my Stickles for some added sparkle. I highly recommend trying this technique - not that hard, and very pretty. I have a couple of other posts to do today as well, so stay tuned. Thanks for stopping by, I adore you comments! !